Our project focuses on the development of brain machine interfaces (BMIs) which helps patients with severe motor and communication disability. 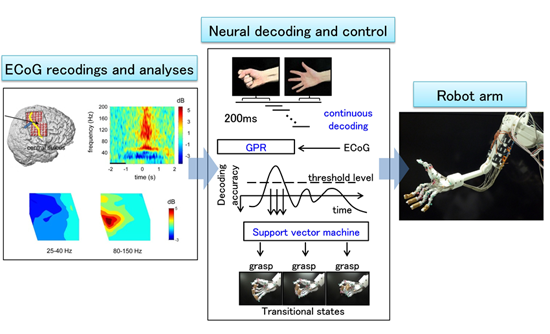 With this technique, the brain signals obtained with intracranial electrodes are decoded in real-time in order to operate a robotic arm or a cursor of PC display. We will develop high density multichannel intracranial electrodes and novel techniques of big data decoding, intelligent robotic control and decoded neuroelectric stimulation (DecNES) for sensory feedback. The goal of this project is to develop practical, fully-implantable wireless BMI system to support motor and communication activity of people with severe neurologic disability such as with amyotrophic lateral sclerosis (ALS). We proceed technological development of large scale wireless communication with small size and low power for implantable devices. We develop the first generation fully implantable wireless BMI system recording 128 ch electrocorticograms(ECoGs), and perform clinical research. We aim at the world’s first clinical application of the BMI system within 5 years. Parallel to it, assume the practical use within ten years, We also develop the second generation fully implantable wireless BMI system with 4000 ch ECoG recording and perform preclinical evaluation of the safety and efficacy to put the system into clinical application within ten years. This contributes to clinical application of technologically-advanced ECoG-based BMIs. We will develop implantable multichannel neural recording system utilizing the state of the art technologies of “ultra-flexible, and –thin transistor integrated circuits and sensors” and “rubber-like stretchable elastic conductors and integrated circuits”. Furthermore, with integrating ultra-flexible, and –thin light-emitting diodes and photo-detectors, we will implement optogenetic function. Our research target is to measure wide range neural signals from small primates and contribute to revealing the functional networks of the brain. 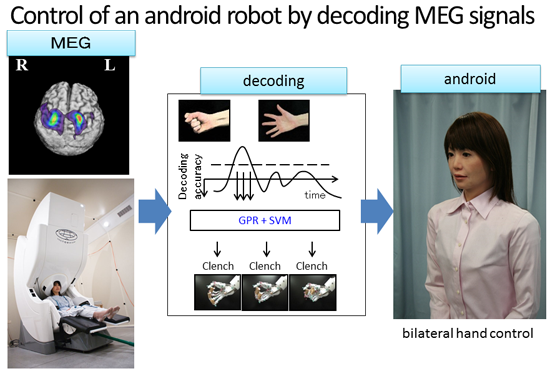 The aim of this project is to control an android robot as intended by decoding neuromagnetic signals recorded by MEG. MEG has the advantage of high spatio-temporal resolution; high temporal resolution compared to functional magnetic resonance imaging (fMRI), and high spatial resolution compared to near-infrared spectroscopy (NIRS) and electroencephalography (EEG). We develop the methods to decode the neuromagnetic signals and to control android robots. We aim to control android robots as intended by whole brain decoding including cognitive brain function in addition to sensory restoration by somatosensory and visual feedback. Swallowing disturbance is one of the major factors as well as motor disturbance to deteriorate the activities of daily living in severely disabled people. 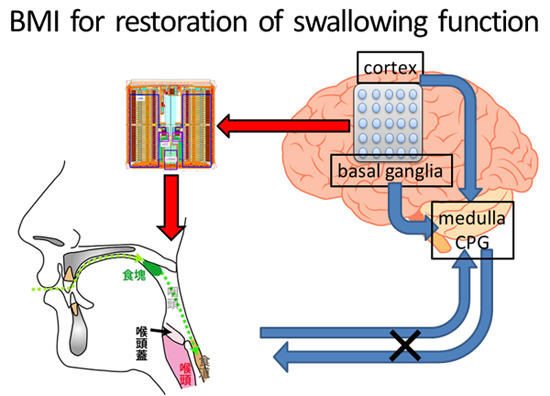 Based on our previous findings of intracranial brain machine interfaces, we aim to reveal neural correlates of swallowing function, to develop a neural decoding method of swallowing, and to establish technological basis of BMIs for swallowing control. BMIs for swallowing control have never been investigated do far. This is a pioneering study which contributes to establishing the technological basis of a landmark therapy for swallowing disturbance.